Valerian and the City of a Thousand Planets opens in theaters July 21. Here’s a deep philosophical question to occupy your mind for awhile. At the front of the fictional, single-seat Lexus Skyjet we see the unmistakable spindle grille that is the current hallmark for the luxury automaker. Lexus says the Skyjet embodies its vision of style, innovation, and performance 700 years into the future. But doesn't the grille technically make this futuristic spacecraft a retro design? It’s entirely possible we’re thinking far too much about this. After all, this is a completely fictional machine designed to provide some nifty product placement for the manufacturer in the upcoming sci-fi film Valerian and the City of a Thousand Planets, which is slated to hit theaters on July 21. Aside from having one of the most sci-fi movie names of all time, the film will feature the Skyjet as a high-performance runabout with stubby wings, presumably giving it the ability to navigate and maneuver both within and outside an atmosphere. 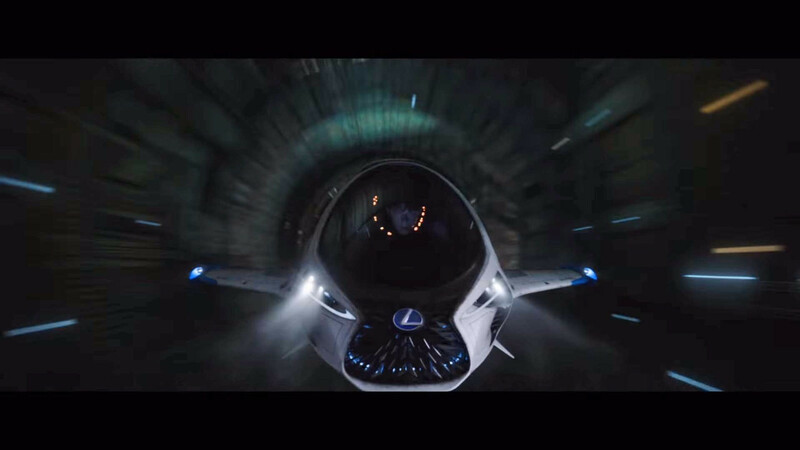 Lexus has launched a month-long ad campaign leading up to the movie’s release, including a short commercial that teases the Skyjet and a longer feature that will be airing soon. The manufacturer also released a few photos of the life-size mock-up to show the Skyjet isn’t just a computer generated spaceship, or a miniature model made big through the wizardry of cinema. The film is based on the French comic series Valérian and follows the adventures of a couple agents in an intergalactic city called Alpha. Actors Dane DeHann and Cara Delevingne hold the starring roles, with support coming from familiar names such as Ethan Hawke, Clive Owen, and Rihanna. The movie is directed by Luc Besson, a sci-fi veteran who helmed The Fifth Element and Lucy among others, and it’s said to be the highest-budget European film ever produced. In other words, the ingredients are there for a pretty exciting sci-fi feature, but sometimes product placements don't carry quite the same momentum – especially when it's something you obviously can't buy. In a month we’ll see how Lexus fares with this new film. And in another 700 years, look for our review on the Skyjet.